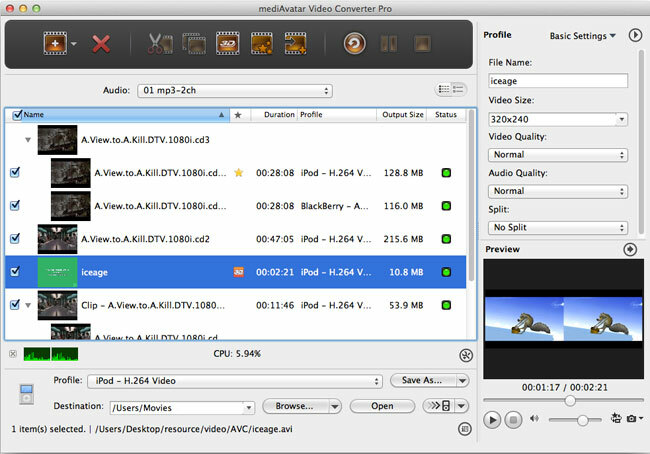 mediAvatar Video Converter for Mac, AVI MPEG MOV FLV MP4 WMV MKV video Mac converter, supports the conversion from Standard video to 3D video format and also supports decoding and encoding almost all video and audio formats including AVCHD (*.m2ts, *.mts), H.264/MPEG-4 AVC, MKV, HD WMV, MPEG2/MPEG-4 TS HD, AVI, MPEG, WMV, DivX, MP4, H.264/MPEG-4 AVC, RM, MOV, XviD, 3GP, etc., making it pretty easy to play them on iPod, iPhone, iPad, Apple TV, Android phones, PSP, PS3, Xbox360, Zune, PMPs, 3GP mobile phones, Wii, NDS, and many others anywhere and anytime. With the abilities to join/clip/split/crop videos and add watermarks/soundtracks/effects/transitions in this Mac video converter, you can convert videos with custom quality and parameters on Mac. Download mediAvatar Video Converter Mac for FREE now to enable the availability of any video files on any multimedia devices! 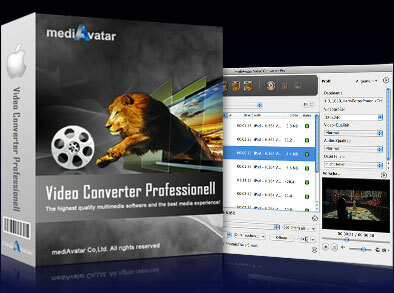 MediAvatar Video Converter Pro for Mac is now here to take you into the 3D world. It can convert almost all kind of normal videos into 3D format in extremely easy and simple steps. Convert AVCHD (*.m2ts, *.mts), H.264/MPEG-4 AVC, MKV, HD WMV, MPEG2/MPEG-4 TS HD, AVI, MPEG, WMV, DivX, MP4, H.264/MPEG-4 AVC, RM, MOV, XviD, 3GP videos on Mac. More than 150 video formats are supported! Extract and convert MP3, WMA, WAV, RA, M4A, AAC, AC3, OGG and any other popular audio formats: convert MP4 to MP3, WMV to WMA, WMA to MP3, etc. Clip as many video segments as you want from any video file; merge video clips or pictures together and insert transitional effects in between to get a slideshow-like video. This Video Converter Mac makes sorts of media files available on all popular multimedia devices (iPad, iPod, iPhone, Apple TV, PSP, PS3, Xbox360, Zune, Android phones, 3GP phones, PMPs, NDS, Wii, Windows mobile devices, etc.) by offering optimized profiles to these devices without any extra settings. Create video slideshows from pictures with transitions in between for personalization; capture video images at intervals of preset time period. Attach picture or text watermarks to mark the videos as your own; add soundtracks to the output videos or replace original soundtracks with new ones. Crop video screen size to remove unwanted borders; adjust the brightness, saturation and contrast of the image; add artistic effects to videos. If you find a video too long, this Mac AVI converter allows you to specify a split time or size to split it into several small parts. Set multiple output formats for a single file to convert it into multiple files with different quality and parameters simultaneously. Use the built-in Bitrate Calculator to compute the video bit rate according to the file size you enter, then output video files with the size you want. Load a batch of video files into this video Mac converter at one time, then convert them offers you the best speed to convert video files on Mac in batches with a single click.Add multiple number of file to convert in one conversion, greatly reducing the time. Edit ID3 tags for MP3 and WMA files; preview videos and take snapshot freely; all the settings are easy to navigate and handle. Converst Standard video to 3D video format.